Impressive new images of the dwarf planet Ceres, captured by NASA’s Dawn spacecraft, have revealed crater-like structures on the frozen, icy surface. 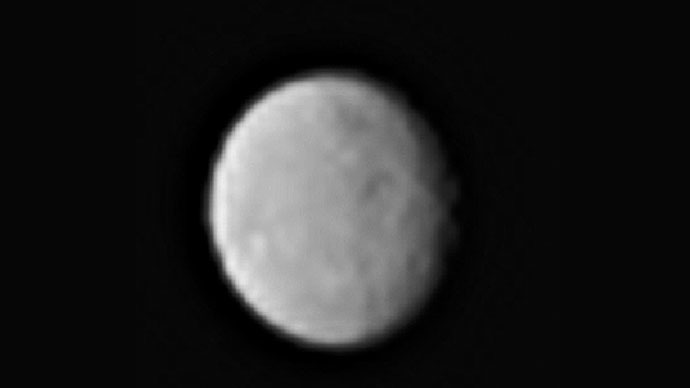 The images arrived as the probe became due to enter Ceres’ orbit. The images will help the Dawn spacecraft as it navigates its way towards Ceres. It is scheduled to enter the dwarf planet’s orbit around March 6 to begin a 16-month study. Dawn’s arrival at Ceres will mark the first time a spacecraft has visited the planet, and the probe will able to linger in its orbit for in-depth exploration. NASA’s interest in the planet is that its surface contains vast portions of ice, and the agency has previously detected water vapor – a potential signal that Ceres may harbor life. “We know so much about the solar system and yet so little about … Ceres. Now, Dawn is about to change that,” Mark Rayman, Dawn’s chief engineer and mission director, said in a release from NASA’s Jet Propulsion Laboratory. “Ceres apparently formed far enough from the sun under conditions cool enough for it to hang on to water molecules. Indeed, scientists have good reason to believe that water (mostly in the form of ice) may make up an astonishing 30 percent of its mass. Ceres may contain more water than Mars or any other body in the inner solar system except Earth,” Rayman wrote in his NASA dawnblog. NASA says Ceres is the largest body in the main asteroid belt, which floats between Mars and Jupiter, and has an average diameter of 590 miles (950 kilometers). Rayman said the dwarf planet probably contains organic materials, some produced by chemical processes with the minerals already there, and some delivered by asteroids that fell to its surface. He added that the combination of Ceres’ internal heat and the weak-but-persistent heating from the sun provides energy, which also is essential for life. The possibility of life is extremely remote, Rayman said – and Dawn’s equipment will be unable to detect it regardless – but the “prebiotic” chemistry will be extremely interesting. NASA's Hubble Space Telescope took the best images to date of Ceres in 2003 and 2004. While the latest set of images is only at about 80% of Hubble's resolution, NASA expects the decade-old images to be eclipsed when the spacecraft has another imaging opportunity at the end of this month.